"Getting the energy mix right is an opportunity for Australia," CSIRO Executive Director Dr Alex Wonhas said. 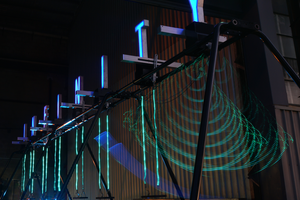 "The CSIRO Infinity Swing is about starting this discussion and showing the community how science and technology has a key role to play in developing smart energy efficient solutions. "These technologies are allowing people in Australia to continue to do the things that they love, but with greater comfort, more affordability and less emissions."